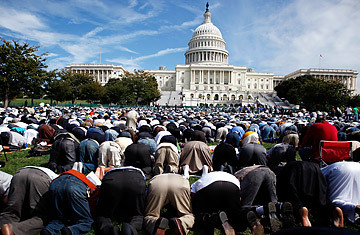 Muslims pray during the 'Islam on Capitol Hill 2009' event at the West Front Lawn of the U.S. Capitol on September 25, 2009 in Washington, D.C.
Opposition to a proposed mosque near Ground Zero swelled into a furor this week after its planners on Aug. 3 passed the last municipal hurdle barring them from building it. New York City Mayor Mike Bloomberg spoke passionately in defense of the project. "Let us not forget that Muslims were among those murdered on 9/11 and that our Muslim neighbors grieved with us as New Yorkers and as Americans," Bloomberg said in a speech that day. "We would betray our values and play into our enemies' hands if we were to treat Muslims differently than anyone else." Bloomberg's predecessor didn't agree. The former mayor of New York City, Rudy Giuliani, claimed that the project, which is partially intended to be an interfaith community center, would be a "desecration," adding that "decent" Muslims ought not object to his opinion. Other GOP politicians and talking heads who have far less to do with the events of 9/11  or, for that matter, New York  have joined the chorus, arguing in some instances that a mosque near Ground Zero would be a monument to terrorists. Such Islamophobia is unsurprising in the postCold War age of al-Qaeda and sleeper cells. And Islam, of course, has long been a bogeyman for the West. For centuries, a more advanced, more powerful Islamic world haunted the imagination of snow-bitten Christendom. When the Spanish arrived in the Americas, they brought the language of the Reconquista with them, sometimes referring to Aztecs and Mayans as "Moors" and to their ziggurats as "mosques." The Sultanate of Morocco was the first government in the world to recognize the existence of an independent United States, in 1778. But it was America's naval expeditions to North Africa  the two early19th century Barbary Wars  that first marked the U.S.'s arrival on the global stage and crystallized a new American patriotism at home. The early history of Muslims in the U.S. was a lonely one. While there are isolated reports of "Moorish" sailors and even an Egyptian dwelling in corners of the colonies, the first significant populations were slaves from West Africa. Bilali Mohammed was born in Guinea in roughly 1770 and died in 1857 on a plantation on Sapelo Island in Georgia, leaving behind a 13-sheaf document in Arabic. It's a treatise of religious jurisprudence specific to the society of Muslim West Africa and one of the earliest classic slave narratives. Abdulrahman Ibraheem Ibn Sori, like the literary figure of Oroonoko in Aphra Behn's famous 1688 novel of the same name, was royalty from a Guinean kingdom before being abducted and whisked away to slavery in Mississippi. As word of a lettered, regal "Prince of Slaves" spread across the country, Ibn Sori won allies and friends and was eventually freed in 1828 by an order from President John Quincy Adams. He left the U.S. for the former slave republic of Liberia in Africa but died of fever soon thereafter, never to return to the land of his birth. Most Muslim African slaves were far less lucky, and memory of their varied cultural heritage dissipated over generations of enslavement. Black Islam would be revived in the first half of the 20th century as a creed of empowerment and redemption. The Nation of Islam, founded in 1933, sought to step away from the indignity of the past with a wholesale rejection of the predominantly white, Christian nation that surrounded them; to this day, the website of the now much diminished group identifies black Americans as descendants of a "Lost Nation of Asia." For prominent activists like Malcolm X, Islam was a badge of otherness, of distinction and pride in the face of old injustices. On the sidelines of these struggles, other Muslims were more than happy to try to fit in. By the end of the 19th century, immigrants from the Ottoman Empire began settling in pockets across the U.S. Some of the first active Muslim congregations in the country began in towns like Cedar Rapids, Iowa (led by Lebanese), and Biddeford, Maine (led by Albanians). In 1926, Polish-speaking Tatars opened one of the first mosques in Brooklyn. By the latter half of the 20th century, the majority of Muslims moving to the U.S. were from South Asia and Arab states. Today, there are an estimated 7 million Muslims living in the U.S., from myriad communities and all walks of life. To speak of them in generalities would be pointless. Nevertheless, since 9/11, a spotlight has fallen on American Islam and the potential extremists in our midst. There are villains: from Sheik Omar Abdel Rahman, the blind Egyptian imprisoned for life for his involvement in the 1993 World Trade Center bombings, to New Mexicoborn Anwar al-Awlaki, an Islamist lecturer who is thought to have preached to a few of the 9/11 hijackers and is now in hiding in Yemen, the first U.S. citizen to wind up on a CIA targeted kill list. Curiously, a conspicuous number of U.S. jihadists have come from non-Muslim backgrounds, like the "American Taliban" John Walker Lindh, who grew up in a prosperous San Francisco suburb, and David Headley, a half Pakistani born in Washington who, before allegedly planning the Mumbai terrorist attacks in November 2008, was running a bar in Philadelphia. Concerted Homeland Security measures seem to rope in occasional terrorism suspects  like the 14 arrests this week of U.S. residents allegedly linked to the al-Shabab militant group in Somalia. But many Muslim communities have come under siege, facing a barrage of media scrutiny and xenophobic bluster. In this context, figures like Imam Feisal Abdul Rauf  the Arab-American cleric behind the mosque project near Ground Zero  stand out. A consummate moderate who has made a career preaching about the compatibility of Islamic and American values, Rauf has been cast as a dangerous radical by the mosque's opponents. Few of them are moved by the name of Rauf's proposed building: Cordoba House, named for the city in Spanish Andalucia where Muslims, Jews and Christians once co-existed for centuries in an extraordinary flourishing of culture and science. In these times, the richness and diversity of Muslim experience, in the U.S. and elsewhere, seem far from the minds of most Americans.